Westmeath's Alan McGrath with Gearoid Burke and Brian Stapleton of Laois during the NHL Div 2A final. Laois have bounced straight back up to Division 1B of the Allianz Hurling League after easing to a Division 2A final victory over Westmeath at Tullamore. When the teams met in Mullingar four weeks ago, Westmeath won a thriller, but there was no denying the O'Moore County's superiority on this occasion. The writing was on the wall for the Lake County after just four minutes when John Brophy pounced for his first goal to make it 1-1 to 0-2. Brophy added a second six minutes later as Seamus 'Cheddar' Plunkett's side took a firm grip on proceedings. Derek McNicholas, who had given his side the lead inside 20 seconds, replied with points for Westmeath, but Matthew Whelan's 65-metre free ensured Laois of a 2-7 to 0-6 half-time advantage. Full forward Brendan Murtagh briefly raised Westmeath's comeback hopes with a goal after the restart, but Laois remained in control and put the result beyond doubt when Tommy Fitzgerald blasted their third major. 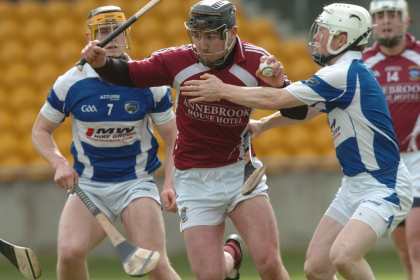 This was Westmeath's second successive Division 2A final loss and their manager Brian Hanley now faces a big challenge to rally his troops for the visit of Antrim to Cusack Park for the Leinster SHC preliminary round on May 5. Laois - E Reilly; B Stapleton, B Campion, J A Delaney; J Fitzpatrick, M Whelan (0-2f), G Burke; C Healy (0-1), J Walsh; S Maher (0-7f), Z Keenan (0-1), W Hyland (0-3); B Dunne, T Fitzgerald (1-0), J Brophy (2-0). Subs: N Foyle for Brophy, W Dunphy for Fitzgerald, C Dunne for Hyland, D Maher for Stapleton, B Conroy for S Maher. Westmeath - P Collins; M Keegan, Adam Price, P Fennell; P Gilsenan, C Jordan, D Fennell; E Price, S Power; R Greville, A McGrath, D McNicholas (0-6f); N O'Brien, B Murtagh (1-2, 1-1f, '65), J Shaw (0-1). Subs: T Gallagher for Keegan, G Greville for Gilsenan, T Doyle for D Fennell, Anthony Price for McNicholas, J Clarke for Shaw.